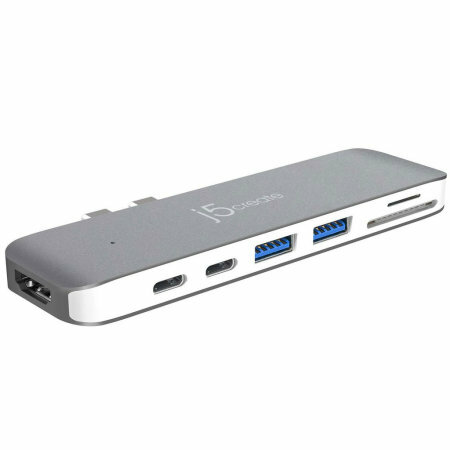 Using both USB-C (USB Type-C) ports on your MacBook Pro, add 2 full-sized USB ports, a Micro SD / SD card reader, 2x USB-C ports and a fully 4K compliant HDMI port. This is a "must have". This low profile adapter brings all the necessary connections without sacrificing anything. The build quality is good* and stays firmly in place. ust perfect! Easy to use and connect with other products. Good price too! This item is so useful and easy to use, able to sync up items very quickly.. Compatible with both the new MacBook Pro 13" and 15"
Expand your USB-C MacBook Pro with additional connectivity options with just one compact and light accessory. With new MacBook Pro's limited to Thunderbolt 3 USB-C ports, the practical j5create Ultradrive adds seven extra ports for use with all of your devices, meaning you won't have to constantly carry around or store multiple adapters. Unlike other Hub's available, the j5create Ultradrive Hub also features a Thunderbolt 3 port, meaning you'll be able to access even more features including up to 40GB/s data speed, as well as enjoy to up to 5K or 2 x 4K @ 60Hz Video output. Further utilising the Thunderbolt 3 port, the j5create Ultradrive provides up to 100W power delivery, enough to charge your new MacBook Pro at full speed. No matter if you have the 13" or 15" MacBook Pro, the j5create Ultradrive will deliver the correct power ouput. 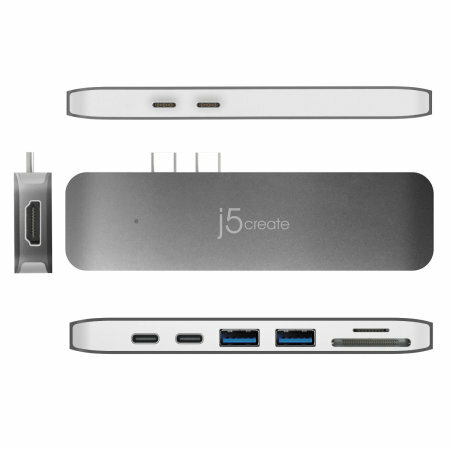 As USB-C devices are becoming increasingly popular, the j5create Ultradrive features a USB-C port meaning you'll be able to connect and charge any of your other USB-C devices including smartphones or any other devices which feature USB-C.
Add 2 traditional USB ports to your computer and connect a wide range of media devices. These could include USB memory sticks, external USB hard drives, printers and connecting almost any other USB compatible equipment. 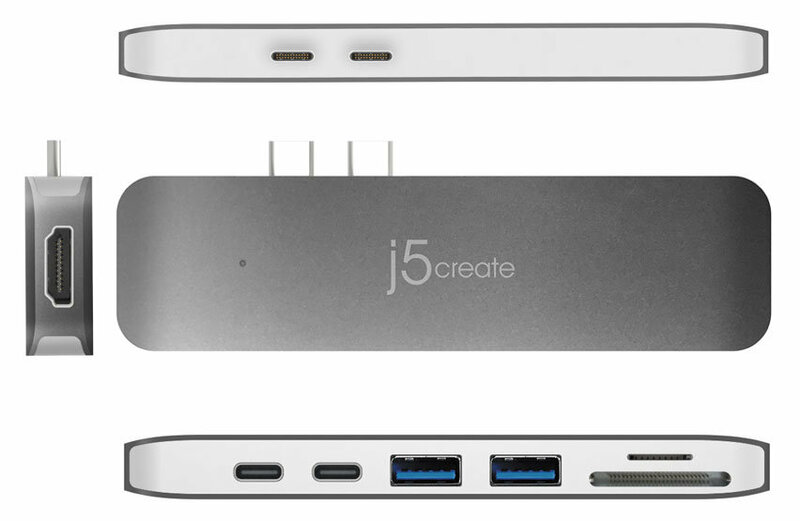 The j5create Ultradrive Hub also features a HDMI video output which supports 4K @ 30Hz, meaning you'll be able to connect your MacBook Pro to an external display and so making this dongle ideal for those in regular meetings and conferences. Additionally this MacBook Pro Hub features an SD card reader for transferring data from devices such as games consoles or cameras to your laptop, making this adapter perfect for photographers. As well as an SD card reader, the j5create Ultradrive Type-C Hub also features a Micro SD card reader for transferring data from your smartphone. With its lightweight and compact design, the j5create Ultradrive Hub is perfect for carrying around in your pocket or bag, without adding any unnecessary bulk. 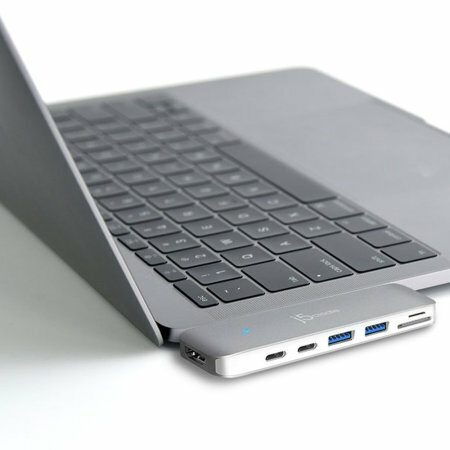 As the j5create Ultradrive Compact Hub makes use of both Thunderbolt 3 USB-C ports found on the new MacBooks, you'll be able to use it on both the 13" and 15" MacBook Pro's, with and without the touchbar. 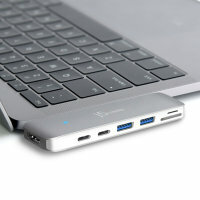 Furthermore as USB-C connectors are reversible, the Hub can be used on either the right or left side of the MacBook Pro, depending on your personal preference.